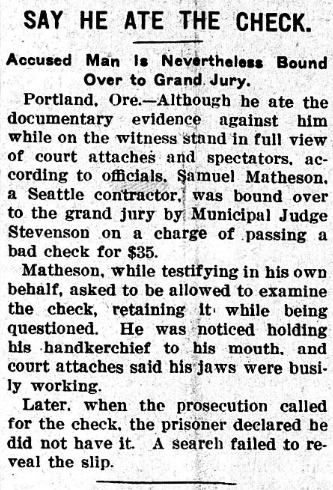 Easily one of my favorite things about scanning old newspapers is happening on odd items like this, which was published in St. Paul, Minnesota’s The Appeal on March 28, 1914. Often it’s something mysterious or weird, but this is just funny. I could probably search further than this item to find out more about Mr. Matheson’s unique approach to boldly destroying evidence in court, but I kind of like just leaving this as is. The photo might have been a tactic meant to make Petras confess. 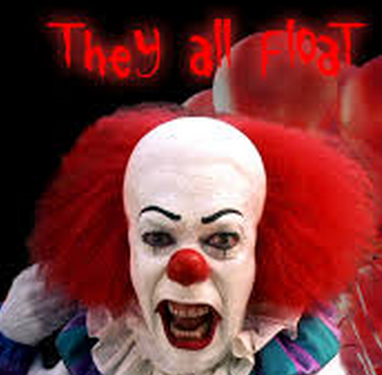 It is also possible investigators made an honest stab at solving the crime with the crazy practice of optography. Optography was just what the article described: making a photo of the deceased’s retina in hopes of capturing the last thing they saw on earth. It was an exquisitely Victorian idea, of a piece with post-mortem photography, where families sat for formal photos with carefully posed, recently deceased loved ones. The idea that one’s eye preserves the very last moment of life held a very powerful hold on the Victorian imagination. 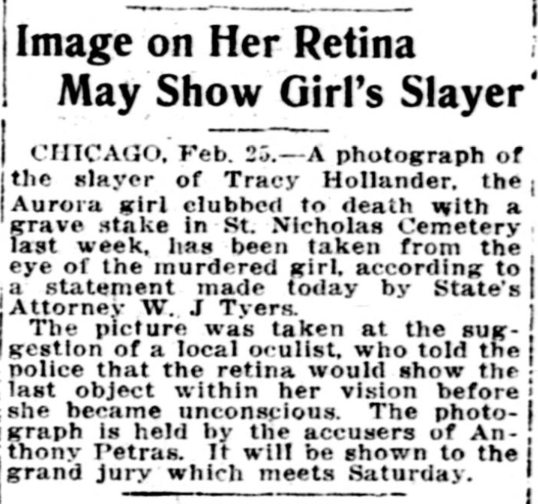 In particular it was suggested that optograms might be obtained from murder victims to help identify their assailant. This rather assumed they would have been attacked from the front at close quarters! From newspaper reports we know that in April 1877, only partly aware of what optography involved, police in Berlin photographed the eye of the murdered Frau von Sabatzky in case it could be of use. We know that news of the German experiments even reached London and that detectives investigating the Jack the Ripper murders in 1888 were presented with a proposal to try the technique. We do not know that this ever happened. Whether or not it was even attempted is highly questionable. Of course it would only have been effective if a victim were to be discovered and operated upon within moments of the killing. It’s easy to understand the allure of the idea if you think about it for a moment, and it’s been revisited since the early 1900s. As the same College of Optometrists article goes on to say, as late as 1975 “police in Heidelberg, Germany, invited the physiologist Evangelos Alexandridis at the university’s Department of Clinical and Experimental Ophthalmology to re-evaluate” the concept of optography with “a view to learning whether they might have a useful role in forensic investigations.” Alexandridis even appeared to produce some interesting results. They just weren’t interesting enough for experiments with the practice to continue. Given how sophisticated cameras are today, it’s surprising someone hasn’t given optography at least one more try. Then again, there really isn’t a good Instagram filter for dead peoples’ eyeballs.